In sharing this animated sequencing story, I have to thank several people! Firstly Ana Lavado Garcia for her drawings and the original story power points some of us have used as part of the resources for JLN member schools.Secondly Ana and Emilie Woodruffe for their native speaker voices and time to put together authentic language in the simple story .Thirdly Little Red Languages for their work alongside WTSA/JLN to bring the "Alien family at the Seaside " story to animated life! We love our extra terrestrial family and their adventures. This year as part of our third local network meeting for the DFE funded WTSA/JLN language project "Language Learning for Everyone " we met the family at carnival for our "Carnival Triarama Conversations"
So here is the story - a short sentence or two per page with animations and sound files. 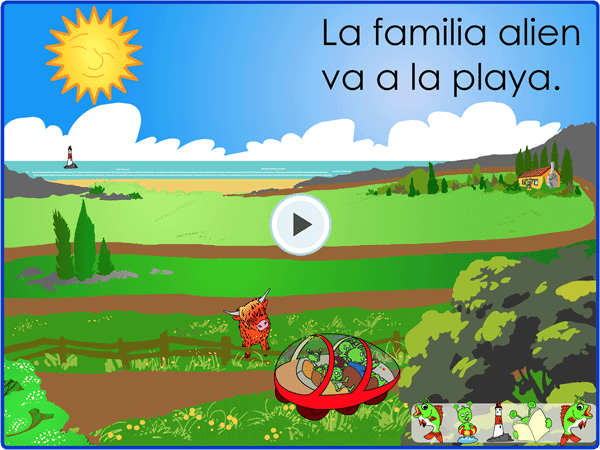 Thanks to Little Red Languages - you can pause the script, conceal the script, replay the sound file , go forwards , go backwards and watch the characters appear on the screen! Spot the "space " theme throughout the pictures ( starry glasses, planet ice creams ,rocket sandcastle etcetra....thanks Ana!)" Ways I would use the story file! Share the front page and look for cognates in the story title. Brainstorm words we may already know about the seaside and might expect to find in the story. Categorise the words- nouns, adjectives, verbs, masculine/ feminine etcetra. Encourage the children to look up words they really hope are in the seaside story. Discuss and identify which words are adjectives, nouns and parts of verbs. Listen to the story all the way through with the text and add actions for each page on a second hearing. Listen to the story to explore the text on each page- show the text on each page, pause on key words, hide the text , practise as a class re-telling the story orally trying to be as exact and true to pronunciation as possible. 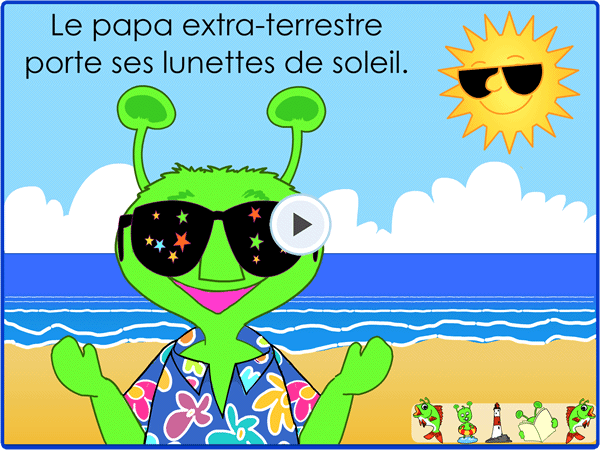 Explore replacement words and phrases- can we change the weather for example or describe dad's sunglasses or baby's enormous ice cream in more detail? Discuss the role of the sequencing words in the text. Can the children in pairs put the story back together in order. Listen to the text but this time conceal the words- can the pairs wave the correct sentence strip to match the sentence they hear? Ask the children to rewrite the text in the order they want it to happen - moving the sequencing words around and therefore changing the order. Let's draw our own story and add our own sentences and sound files! We really hope you enjoy using this story and are able to join us next term if you are in the North West for one of our Local Network Meetings.